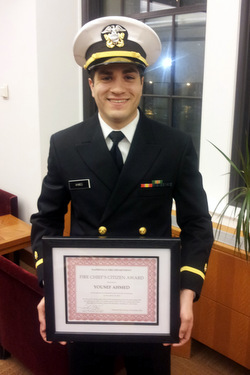 Yousef Ahmed, a third-year medical student, was one of seven people recently recognized by the Naperville Fire Department for coming to the aid of a runner who went into cardiac arrest about six miles into the inaugural Edward Hospital Naperville Marathon and Half Marathon. At the event, Ahmed was volunteering as a guide runner for a blind athlete with fellow second-year medical student Joseph Simonett. Around mile six they saw a man receiving CPR by three runners, all nurses. Ahmed split from guiding the blind athlete to run to the scene. He could not find a pulse on the man and, concerned for arrhythmias, asked a police officer for an automated external defibrillator (AED). He then placed the AED pads on the man’s chest and delivered shock. The man regained consciousness within a few seconds, and Ahmed remained at the scene with the nurses to gather the patient’s history before the paramedics arrived. After relaying the history, he finished the marathon.